Henry VIII (28 June 1491 – 28 January 1547) was the King of England from 1509 until his death. He is perhaps one of England's most famous monarchs because he and Thomas Cromwell the Archbishop of Canterbury split from the Roman Catholic Church and the Pope, and he married six times. His physical decline dominated his later reign and he became hugely obese. As he lay dying in 1547, Henry's last words are reported to have been "monks monks monks", with certain historians believing it a reference to the monks he evicted during the dissolution of the monasteries. 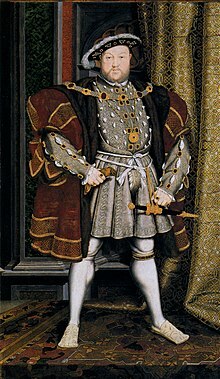 He died at the age of 55 in 1547, on the day which would have been his father King Henry VII's 90th birthday. Henry VIII was born in Greenwich. His mother and father, Elizabeth of York and Henry VII saw little of their children. Henry was their second son. He had his own servants and minstrels, including a fool named John Goose. He even had a whipping boy who was punished for Henry when he did something wrong. Prince Henry enjoyed music and was very good at it. At the age of 10, he could play many instruments, including the fife, harp, viola and drums. Henry VIII was a scholar, linguist, musician and athlete at his early age. He could speak fluent Latin, French and Spanish. He had the best tutors and he also had to learn jousting, archery, hunting and other military arts. Henry was very religious. Young Prince Henry was now the heir to the throne. While his father was alive he was watched closely, because the King feared for the safety of his only remaining male heir. Henry could go out only through a private door, and then he was watched by specially appointed people. No one could speak to Henry. He spent most of his time in his room, which could only be entered through his father’s bedroom. Henry never spoke in public, unless it was to answer a question from his father. He kept his enthusiastic personality under control on public occasions because he feared his father's temper. He was given little training for his future role as King by his father and relied heavily on his counselors in the early years of his reign. In 1509, Henry VII died of tuberculosis as well and his son became King Henry VIII. He was 18 when he was crowned king and Catherine was crowned queen consort. Henry VIII spent a lot of time at a magnificent building named Hampton Court that belonged to his friend, Cardinal Thomas Wolsey. He spent the equivalent of £18 million renovating the Court and building things such as tennis courts and jousting yards. However, Cardinal Wolsey failed to get an annulment for Henry when he wished to divorce Catherine of Aragon. Many people think that this is the reason why Henry sacked Cardinal Wolsey and took Hampton Court from him. After his divorce from Catherine of Aragon, Henry VIII married Anne Boleyn, who was younger than Catherine and still able to have children. When Anne, just like Catherine, only had a daughter and no sons, Henry blamed her for treason and had her beheaded by a French swordsman. He then started looking for another wife. Henry's most loyal official, Thomas Cromwell, helped him to find a way to get rid of Anne, by finding people who said that she had been the lover of several other men. Anne was put on trial and found guilty, and she was executed by having her head chopped off. After a while, Henry changed his mind. As he still only had one son, he realised that it might be a good idea to marry again, and he agreed to marry Anne of Cleves, a German princess. When Anne arrived, Henry did not think she was as pretty as she looked in the pictures he had seen, and he was not satisfied with her. Anne was also unhappy and agreed to be divorced from Henry after only a few months. In the meantime, Henry had noticed a young lady at court, called Catherine Howard, and thought that she might make a good wife. Catherine Howard was a cousin of Henry's second wife, Anne Boleyn. Henry and Catherine got married in 1540, but Catherine was much younger than Henry and she soon got tired of him and started to flirt with other men. After they had been married for just over a year, Henry found out that Catherine had been having an affair with someone else. She was found guilty of treason and was executed, just like Anne Boleyn had been a few years before. Henry's sixth and last wife was called Catherine Parr. She was a woman in her thirties who had already been married twice. Her first two husbands had been much older than she was, and both had died. Henry thought that she would be more sensible and faithful than his other wives, and he turned out to be right. Catherine Parr stayed married to Henry for over three years until he died, but they did not have any children. In 1520, an event named; 'The Field of the Cloth of Gold', took place in Calais which belonged to Britain rather than France at the time. It was organised by Britain (and therefore Henry VIII) to celebrate peace between France and England because they had been at war for a long time. Music, dancing, food, wine and culture dominated the event and millions of pounds were spent on the event (in modern-day money). It is clear that no expense was spared. The event lasted for two-and-a-half weeks. Henry famously wrestled King Francis I of France and lost. Henry often liked to be captured in his portraits with either food or pets. He had many pets. Henry was often seen with his dog. He owned a white pug and was very aware of how much his dog represented him as a wealthy man. In 1536, the Act of Union was passed under Henry's rule which had a long-lasting effect on Wales as a nation. The Act of Union meant that Welsh people were forced to speak English and things such as road signs were translated into English. The royal family, who were based in London, were now officially in charge of Wales. However, the Act also meant that Welsh citizens were given the same legal rights as the English so there was an upside to this new law.